In 2013, the original seminal line up of Killing Joke will embark on their first ever career spanning Singles World Tour. Fans can expect a jaw dropping set of Killing Joke classics – ‘Wardance’, ‘Requiem’, ‘Follow the Leaders’, ‘Lets Go to the Fire Dances’, ‘Eighties’, ‘Love Like Blood’, ‘Kings and Queens’, ‘Millennium’, ‘Pandemonium’, ‘Money is not our God’, ‘Seeing Red’,‘In Cythera’ plus loads more. However, this is not some going through the motions nostalgia tour! Jaz Coleman is furious, political and sharp as a knife, just as he’s always been. Geordie Walker’s distinctive guitar sound is as stately yet snarky as ever, Youth’s bass is as ferocious as it is technically minded and Paul Ferguson’s drums are a controlled frenzy of apocalypse inducing dance beats. Killing Joke’s Singles World Tour includes Australia (their first time here since 2004) and New Zealand and is the must see event for 2013! Whether new to the legacy that is Killing Joke and for those dedicated fans dying to hear some of the classics revitalized through a contemporary gloss, this is one of the most anticipated tours of the year! Incredibly although Jaz Coleman is a part time resident of Auckland this will be Killing Joke’s first shows on New Zealand soil! 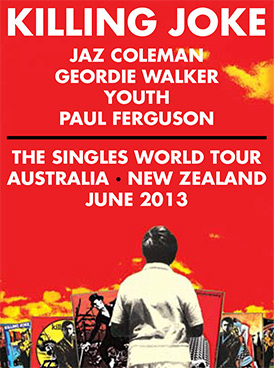 via Killing Joke | The Singles World Tour | Australia and New Zealand June 2013.